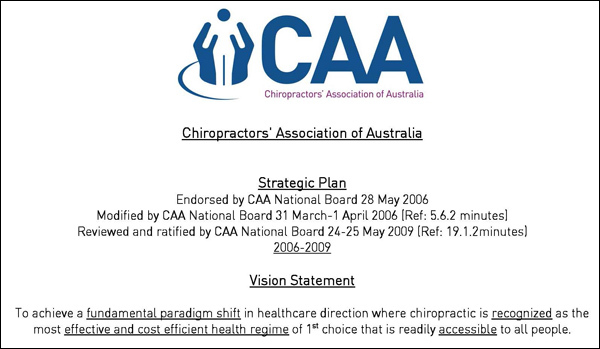 In 2006 the Chiropractors' Association of Australia came up with a Strategic Plan. They even had some major objectives. Unfortunately they probably have managed to influence health policy in the last few years, because chiropractors can now legally use the title "Dr" in front of their names to confuse the public about reality. We are still waiting for that "credible scientific research" though. Actually, if chiropractic was shown to be useful to treat any medical condition and this was demonstrated using properly-conducted clinical trials the appropriate term might be "incredible research". Much like hearing about successful transmutation of lead into gold, or achieving true "free energy", or maybe finding a single cure for all forms of cancer. Everyone has been getting very excited over the last week because the government-sanctioned Chiropractic Board of Australia has announced that it is going to have a mighty crack-down on chiropractors who spread lies about vaccination. (I would have avoided the dreadful "crack-down" pun used by all media outlets reporting this, but it comes directly from the CBA. They wrote the material.) Here is the media release from the CBA. introduced random audits of practitioner compliance with the Board's registration standards. Details of the Board's initiatives are published in the report of its July Board meeting. Board Chair, Dr Phillip Donato OAM, said the Board took its core role of protecting the public extremely seriously. "We know the vast majority of Australia's 4,600 chiropractors work effectively to provide high quality care in the best interests of their patients," Dr Donato said. "However, the Board takes a very strong view of any practitioner who makes unsubstantiated claims about treatment which is not supported within an evidence-based context," he said. "We will not tolerate registered chiropractors giving misleading or unbalanced advice to patients, or providing advice or care that is not in the patient's best interests." The Board's Code of Conduct, published at www.chiropracticboard.gov.au/Codes-Guidelines.aspx, details its expectations of the chiropractic profession. "We hold chiropractors to account against the standards set out in the code and anyone with any concerns about individual registered chiropractors should bring these to the Board," Dr Donato said. The Board also cautioned chiropractors about marketing and promotional activities that breach the advertising requirements in the National Law. Section 133.1.e of the National Law specifically rules out directly or indirectly encouraging the "indiscriminate or unnecessary use of regulated health services". "The Board reminds chiropractors that they need to comply with the Law and the standards set by the Board. We take a very dim view of any practitioner who does not put the best interests of their patients first," Dr Donato said. I am far less sanguine about this than many of my friends. 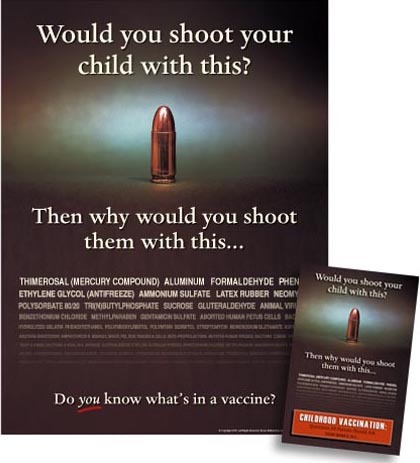 My prediction is that chiropractors will carry on as before opposing vaccination, sorry "advising their customers of the potential dangers of vaccines", and not a single chiropractor will be deregistered and pushed out of business by this. Oh, there might be some PR-worthy wrist-slapping but that will be all. The Board really has little influence over what chiropractors say or do, but a little lip service and window-dressing never goes astray. 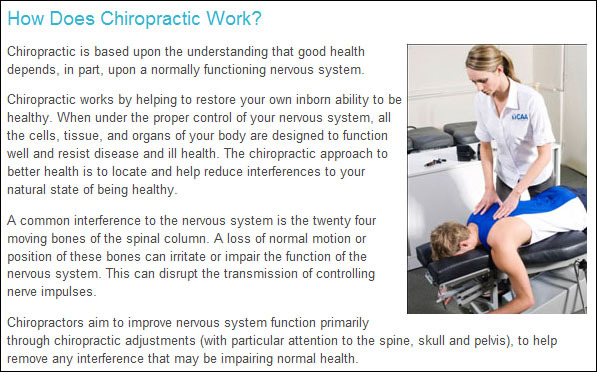 The professional body of chiropractors (with about 50% of them belonging to it), the Chiropractors' Association of Australia, has already expressed disquiet at the Board's threat and suggested that the responsibility of chiropractors to provide "good" advice to customers overrides any attempt by the Board to pander to people who don't understand the value of a good neck snap. Two things in the media release are encouraging, however. That should mean that neck twisting is out because of the well-known and proven danger of cerebral artery damage caused by chiropractors doing sudden and sharp manipulations of the cervical spine. Then there are the people put at risk because they go to a chiropractor instead of a doctor and therefore miss out on correct diagnosis and treatment of medical conditions, but that is a general and valid criticism of all "alternative" medicine. Well, there goes the whole of chiropractic. Take out the stuff that's not based on evidence and there's nothing left. Perhaps we can look forward to a coming Board meeting when they follow the example set by the gay-bashing Exodus International organisation and announce that the whole chiropractic thing is over and they apologise to all the people deceived since DD Palmer invented the scam and his son worked out how to turn it into a business. Oh, to any chiropractors who object to my use of the word "customers" and would prefer "patients", I say "Dear Mr X, when you are a doctor, not just someone who likes to be called 'Doctor', I will use the word 'patients', but not before". Chiropractic has been getting its share of publicity lately, and to my great pleasure this attention has been focused on the uselessness and dangers of this particular form of medical charlatanism. In July Australia's premier television science show had a look inside the profession, and this week two expos's have appeared. The first is an article in the Sun Herald newspaper. This story is disturbing for several reasons, but the title and the first three paragraphs provide a good summary. Chiropractors have no business touching children of any age. (I would be happy if the minimum age for treatment by one of these quacks were to be legislated to be 120 years.) There is nothing that they can provide that can increase the well-being of infants. Adults might get a placebo effect from hearing pops from their backs but babies won't and should not be exposed to the dangers of this unregulated form of sympathetic magic. I have written before about the uselessness of the Chiropractic Board of Australia, which only exists to provide a veneer of respectability to chiropractic so that its practitioners can say "See, we are just like real doctors". In a clear case of negligence and inappropriate treatment leading to severe injury the best they can (or will) do is hide the problem and tell the quack to get advice from another quack. The expression ''expert in the field of paediatric chiropractic" is precisely analogous to ''expert in the field of unicorn metabolism" or ''expert in the field of exorcising ghosts". When the discipline is meaningless expertise means nothing. Real doctors and other medical staff have to jump through many hoops before they are even allowed to go near patients in hospitals, and this even applies to relatives. Nobody is allowed to treat children without undergoing police checks; nobody can treat any patient without the institution's permission and without it being part of a treatment plan (and an emergency creates its own plan); nobody can just walk in, no matter what expertise they have, and start work even if everything they might need to know is on the documentation at the end of the patient's bed. Nobody! Not doctors, not nurses, not specialist doctors, not ambulance paramedics. Nobody. Except chiropractors, who lie that they are just visiting someone. You might think that this last point is something that happens rarely, but my friend Peter (who prefers to be called Reasonable Hank to protect his privacy and shield him from attack) has done a comprehensive analysis of chiropractors' Facebook comments and pages and has found that the practice seems to be widespread. 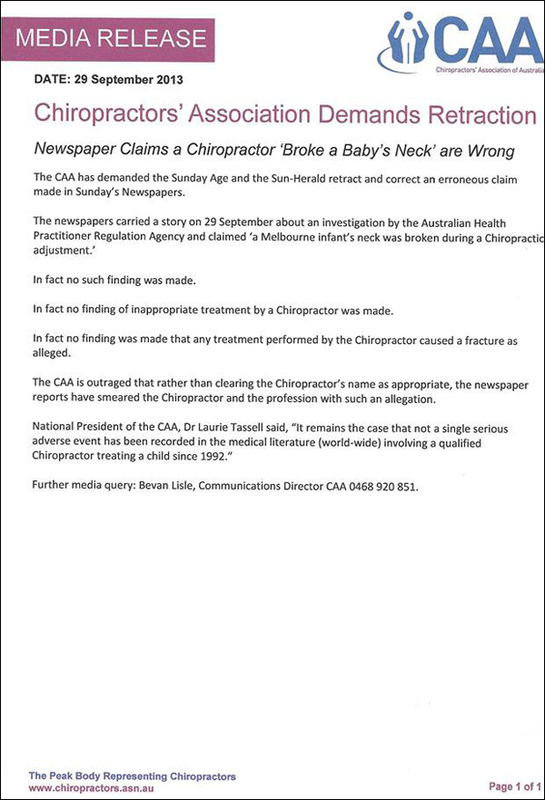 It also seems to be condoned by the Chiropractors' Association of Australia, which is hardly surprising given that members of the various CAA committees admit to this sort of unethical behaviour. People have said that the Chiropractic Board of Australia should do something about this, but why would anyone expect it to do more than hand waving and platitudes. It's not there to regulate or control chiropractic, it's there to give the "profession" a professional appearance. Its response to a child with a broken neck shows what it finds acceptable. People have said that the Chiropractors' Association of Australia should do something about this, but why would anyone expect a club for charlatans to try to do anything about its members following its leaders' example. There is only one way to fix chiropractic, make it safe and force practitioners to behave ethically. That is to close it down completely and consign it to the rubbish bin of history along with blood-letting, cauterising and the four humours. It was invented in 1897 and became obsolete three minutes later. Why is it still here? And if you think it can't be silly as well as dangerous and useless, here is picture from a chiropractor's Facebook page showing him adjusting a turtle. Please remember that the turtle's shell is part of its spine and the plates in it are totally unmovable. The CAA has responded. By some strange stroke of fate this media release appeared on the Facebook page of the Australian Vaccination Network.